Artwork Panel: 31.6cm x 65.3cm ≈ 12½" x 25¾"
Silk/Brocade: 41cm x 125cm ≈ 16" x 49¼"
Sweat soaks into the farmland. should know it came from great work and toil. It is sweat that moistens the soil. That every grain comes only through long toil? This style of calligraphy is a flowing caoshu. The word cao means "grass" and shu means "script" or "writing". In English, this is often translated as "cursive". In this style, each character flows into the next. Instead of distinct strokes as seen with more conventional characters, you'll see just one almost-continuous stroke. Because of the special cursive nature, many Chinese people probably can't read this poem without some hints or help. The artist's name is (Xu Xue-Qin) of Jia Shan, which is in Zhenjiang Province of Southern China. He currently works as a school teacher in Jia Shan. Along with teaching, writing calligraphy is his passion. 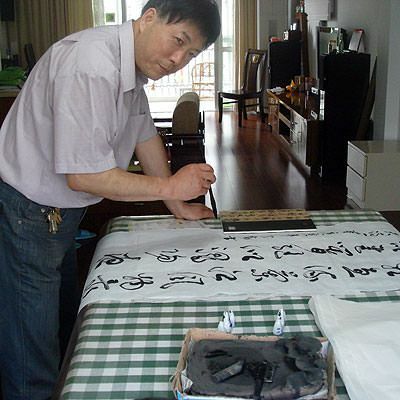 Xu Xue-Qin is far beyond a hobbyist calligrapher. His calligraphy has been awarded and certified for its quality (see certificate below from a nation-wide calligraphy competition, May 2010). 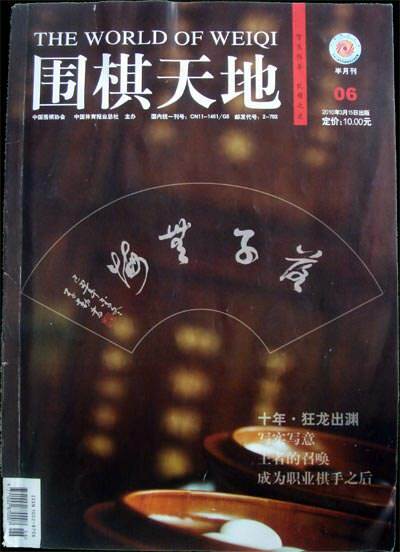 His calligraphy was also chosen for the cover of a widely-read magazine, The World of Weiqi. His calligraphy is also featured in calligraphy textbooks. On weekends and evenings, he can be found teaching calligraphy at a local art school. Note: I do have a bit of guanxi with this calligrapher which allows me to offer his work to you at a very special price. He happens to be my wife's uncle. of The World of Weiqi magazine. The artwork was painted on Chinese xuan paper (known incorrectly as "rice paper" in the west). This is a high-quality handmade paper which is based on mostly cotton pulp. This artwork was taken to our workshop in Beijing where we mounted it as a nice two-toned silk brocade wall scroll. We use more xuan paper, silk brocade, brass hardware, wood, other paper products, and our specially-made solid-wood knobs to build our wall scrolls.